Another pleasant day saw us past Furnace Vale Marina and the Swizzles factory with those lovely smells again. An of course the Peak district is never far away. Remembering Chris had a bit of a struggle with the lift and swing bridges on our way up I volunteered to do them this time. Chris is still nervous on the helm but she does herself an injustice as she maneuvered AmyJo with ease. If she was bricking it she didn't let show especially with another boat following. Chris looking rightly pleased with herself. I do like this place, could happily settle there. The approach to Marple junction is preceeded in this direction by a marina. Its not clear which way the cut goes from this viewpoint but a thoughtfully placed arrow guides one in the right direction. I wonder how many have had to reverse out of the marina having not heeded the arrow? It being a Saturday and rejoining the Cheshire ring we cautiously made our turn at the junction but surprisingly the way was clear, not even a boat coming up the locks. Having passed through the gauging narrows we found a mooring just after the next bridge 'ole opposite the Ring-o-bells pub. Hopefully it will not be too lively tonight. After lunch and whilst I typed up today's post Chris took herself off for a wander round the town. We needed diesel and knew Brian on Alton was due in Bugsworth tomorrow PM so I stayed aboard incase he appeared as we knew he was close. Chris was back before Alton arrived, in fact it was 6:30pm when Alton's Claxon heralded their arrival. Brian and his wife were aboard and whilst we filled with diesel we chatted about our plans and where we were headed. Brian offering great places to stop all seemingly by pubs. I wonder why. Fill her up please Brian. The rest of the evening was spent enjoying a great band playing in the Ring-O-Bells pub nearby. Pretty good they were too. Our favourite mooring on the Macc was by Bridge 86. Railings instead of a hedge on the towpath, so there are great views across Cheshire, and it's a short walk across the fields to Little Moreton Hall, which is National Trust, and well worth a visit, purely for the extreme wonkiness of the building! Thanks for that tip. We'll definately look into that as it sound great. 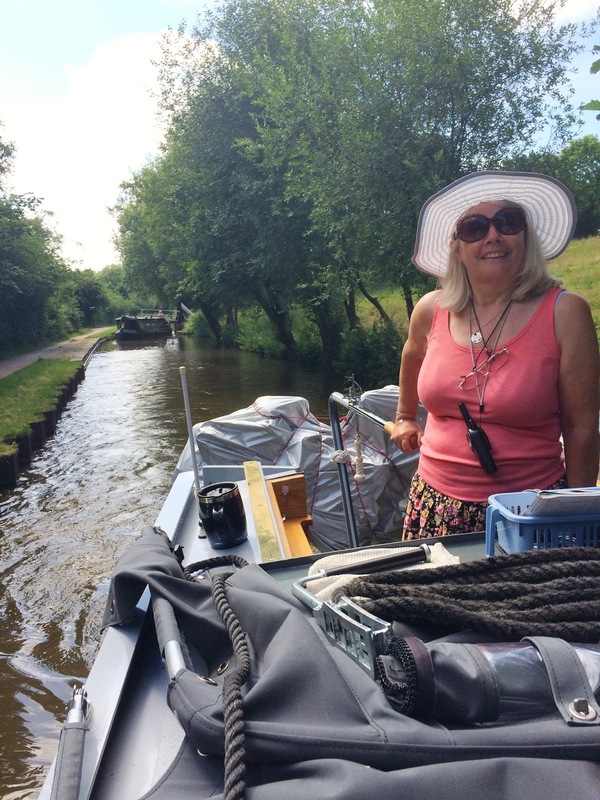 Summer Cruise Days 7 & 8 Stop over in Bollington.